A day in Koh Dak island to get close to local life and exploring the handicraft village in this area. Afternoon visit Champey Academy of Art, founded in 2013, Champey Academy of Arts is a non-profit school offering the youth of Phnom Penh free training in Cambodian traditional arts including dance, music, drawing and painting. Champey’s mission is to inspire young people to preserve, protect and promote their nation’s culture. Afternoon visit Tuol Sleng (including) (S-21) has been turned into the Tuol Sleng Museum, which serves as a testament to the crimes of the Khmer Rouge 1975, Tuol Svay Prey High School was taken over by Pol Pot’s security forces and turned into a prison known as Security Prison 21 (S-21). This soon became the largest center of detention and torture in the country. After your breakfast start tour to visit Silk Island/Koh Dach Island by taking the private boat. 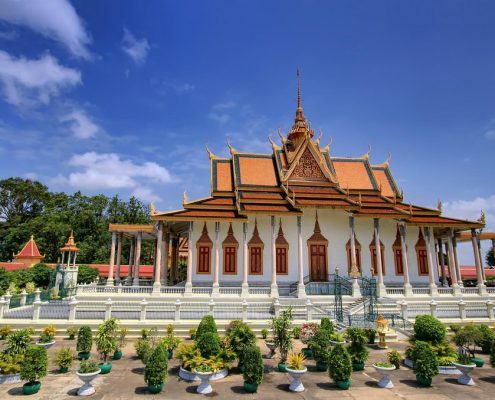 Upon arrival you will continue by Tuk-tuk to visit this famous island; is located 30 kilometers along the Mekong River and it is roughly about 15 kilometers northeast of Phnom Penh. On Koh Dach you can visit a silk weaving village including visit Community Training Of Khmer Traditional Silk Weaving and watch the woven silk on old looms. The island is also famous for its handicraft production, pottery, osier craftwork, woodcarving, painting and jewelry cutting. This traditional silk weaving village of handicraft production is the best place to buy home some excellent souvenirs then continue to visit Koh Dach Beach. This beach is very interesting beach in Koh Dach commune. Lunch at local home stay, then in the afternoon back to Phnom Penh for overnight. 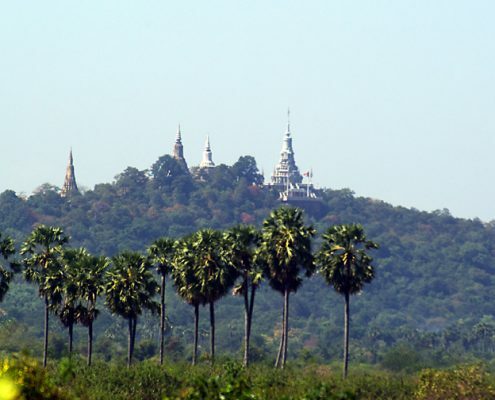 Visit Oudong Mountain, about 40 kilometers northwest of Phnom Penh along National Route 5, a mountain topped with the spires of stupa rears from the plain like a fairytale castle. 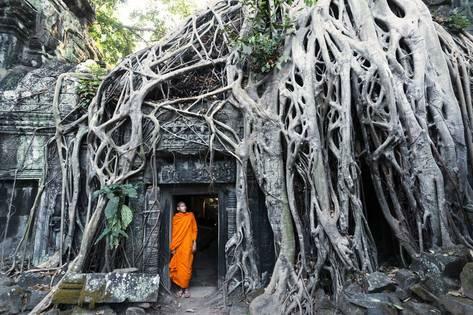 This is Phnom Oudong, at one time an ancient capital. 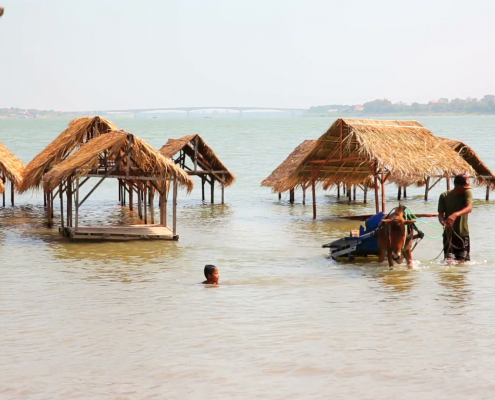 We Stop on the way to visit Kompong Chhnang where you a walk in the traditional villages of potters where the craftsmen make the braziers for cooking and many other useful items to everyday life and the decoration of the Cambodian houses. Lunch at local restaurant, then continue our journey to Battambang directly. Overnight will be at hotel in Battambang. 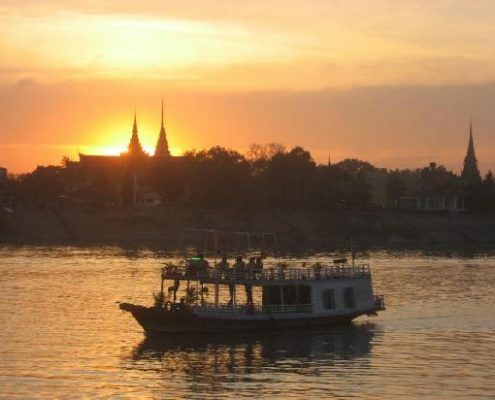 Visit floating village of Lac Tonle Sap, at Kampong Kleang floating village.Visit Boeng Mealea temple. 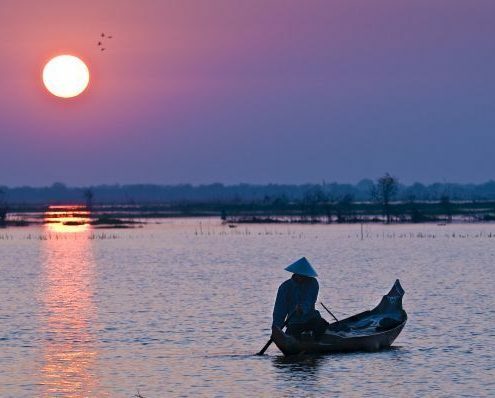 Free on your own leisure in Siem Reap. 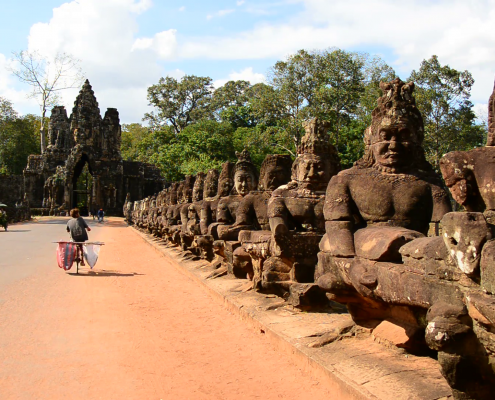 Free on your own leisure until transfer to Siem Reap International Airport with driver only.